The Dual Fusion pedal from Wampler Pedals is, they think, the first overdrive pedal specifically voiced to the new breed of fusion guitarists - but it's so versatile it can find a place on ANY board of ANY genre. When Wampler first met Tom in early 2012, he was already using our Euphoria and Paisley Drive stacked together to give him the tones he required. But, something wasn't quite right; those pedals are voiced for other genres of music altogether so we set about honing the tones to match his style of playing. He needed more transparency, a tighter and controlled response on the bass end and when stacked up they needed to sound and feel like an amp running at high levels and give each string complete clarity and response. Over a year later, Wampler had the Dual Fusion. With two independent circuits that are based, but are completely modified, on the Euphoria and Paisley Drive, Tom finally has a tone that can be used when he is in full flow as a musician. 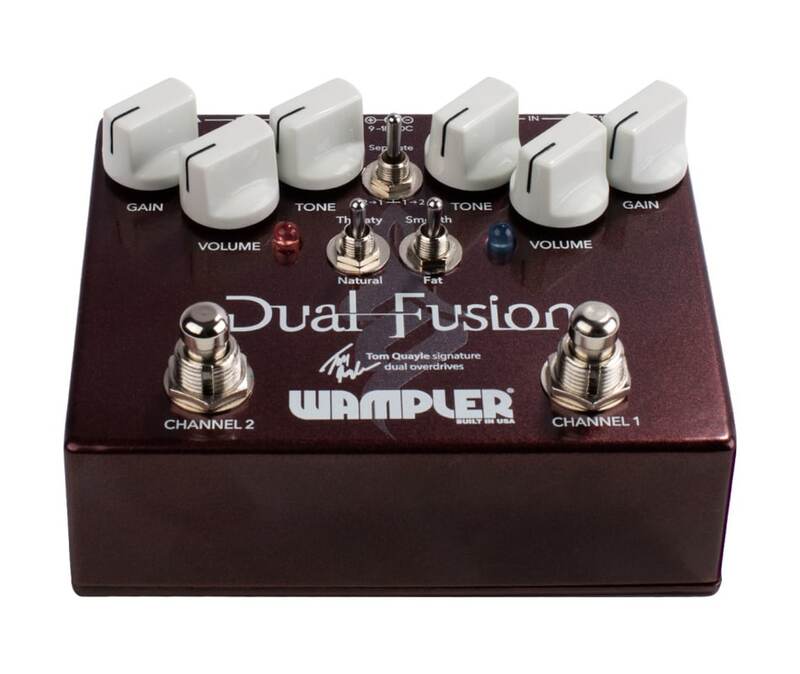 The Wampler Pedals Dual Fusion, the first pedal to be specifically voiced for the fastest growing breed of musicians around. With the most versatile stacking/signal path options available on an analog pedal, it is the foundation of modern Fusion. Add in the versatility you expect from Wampler Pedals, the Dual Fusion will appeal to guitarists from all genres at all levels.